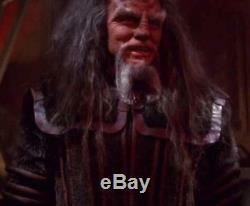 Star Trek Episodes where this Klingon costume appears. The Next Generation - All Good Things: worn by (future) Governor Worf when he is assisting Captain Beverly Picard find the temporal anomaly. Voyager - Prophecy: where BElanna Torres has the baby messiah and Voyager has to house 200+ Klingons. This costume appears with shoulder battle armour and three arm rings. 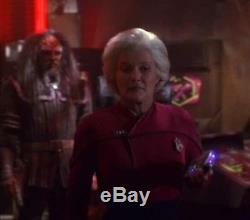 Voyager - Endgames: (the last episode) where Captain Janeway steals a device from the Klingon Captain. This costume appears with battle armour shoulders and three arm rings. 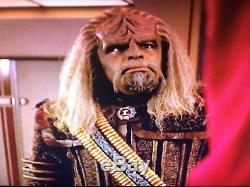 Enterprise - Unexpected: where Trip gets pregnant. 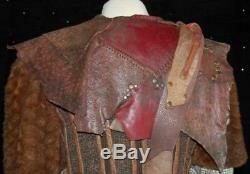 This costume is worn by the Klingon Captain, with leather shoulders and three arm rings. Memorable quote: I can see my house from here! 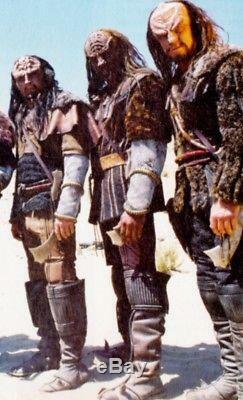 Enterprise - Marauders: This costume is worn by a Klingon, in its final configuration without arm rings. 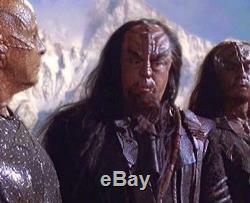 This imposing Klingon costume (in its current guise) was worn by various actors during the Star Trek: Enterprise series. Research has also indicated that it was previously made for and worn in at least two episodes of Voyager and the final episode of TNG, please see the screencaps. Often during the production of Star Trek, costumes were adapted and re-used for filming different episodes. The coat is made of pleated woven brown and tan fabric with brown leather trim. 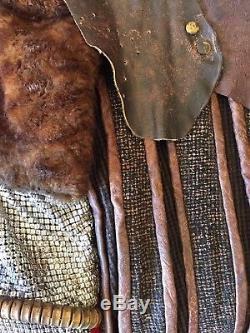 An assortment of leather pieces and brass fasteners has been attached to the shoulders for detail. The harness is made from an amalgamation of leather pieces over a fabric frame complete with leather rope style details and leather stitching. The outfit is complete with chocolate brown color pants that have pleats down the front and back and stirrups at the feet. There is a small hole in the crotch along the seam and slight distress in the back. 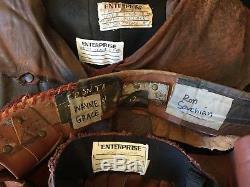 There are two sewn in Star Trek Enterprise name tags indicating that this costume was worn in multiple Enterprise episodes, by at least four different actors including Vince Deadrick. Underneath the main Enterprise name tag is stitch residue suggesting that a smaller name tag was previously present... Which was presumably the original Voyager name tag. 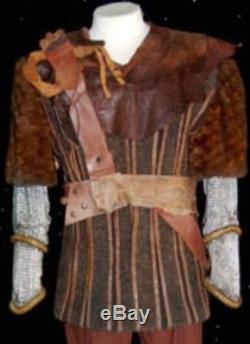 This costume came from The Its A Wrap Auctions and comes complete with the COA. 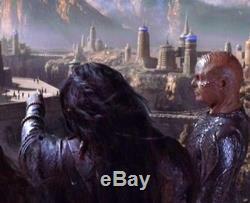 The item "Star Trek TNG Voyager Enterprise Klingon Screen Used Costume Many Episodes WORF" is in sale since Saturday, May 5, 2018. This item is in the category "DVDs, Films & TV\Film Memorabilia\Props\Original". The seller is "hopperspecial" and is located in King's Lynn. This item can be shipped worldwide.